Saint Varlaam was born about 1590 to a family of free holders, in Neamţ region. His baptism name was Basil. He went to Zosim Skete, in the valley of Secu creek, ever since he was a young man, where he learned Slavonic and Greek. There, village chief Nestor Ureche and his wife Mitrofana founded Secu Monastery in 1602, which hosted a school too. The young man Basil joined the community of the new monastery where he took the monastic vows with the name of Varlaam. Having been a good adviser, soon he was appointed igumen of the monastery. Venerable Varlaam studied the depths of the books with much diligence, translating the Ladder of Saint John Climacus, in 1618. Then, due to his diligence and virtues he was raised to the rank of an archimandrite. Having become a personal adviser to the righteous martyr ruling prince Miron Barnovshi (1626-1629; 1633), and then igumen of Dragomirna Monastery, in 1628, archimandrite Varlaam was sent to Kiev and Moscow to buy icons for Dragomirna and Bârnova Monasteries as well as for the church the ruling prince had founded in Iaşi. Back in the country he received the sad news about the death of the great metropolitan Anastasie Crimca (†19 January 1629) and that of the dismissal of ruling prince Miron Barnovschi and he retired at Secu Monastery. In 1632, during the reign of Alexandru Iliaş (1620-1621; 1631-1633), archimandrite Varlaam was called, by God’s will, to pastorally care for the Metropolitanate of Moldavia, after metropolitan Anastasios II (1629–1632) passed away. The new metropolitan joined study with prayer and the wise words with the good deeds. During his pastoral service, the Metropolitanate of Moldavia benefited of much help from the righteous prince Vasile Lupu (1634–1653). Supported by Saint Petru Movilă, metropolitan of Kiev (†1647), in 1640, metropolitan Varlaam set up the first Romanian printing house in Moldavia, which he placed at the Three Saints Hierarchs Monastery in Iaşi. Wise defender of the true faith and of the unity of the Orthodox Church in difficult times, metropolitan Varlaam has been closely involved in the organisation of the Synod of Iaşi, in 1642, which improved and approved the Confession of Faith drafted, in 1638, by Saint metropolitan Petru Movilă of Kiev, a confession that provided the Orthodox clergy and faithful with a guide in their fight against the deviations from the Holy Tradition of the Orthodox Church. The wise metropolitan Varlaam of Moldavia was appreciated both in the country and abroad. Thus, due to his devotion and wisdom, in 1639, he was one of the three candidates proposed to be elevated to the throne of ecumenical patriarch of Constantinople. Having been a good and diligent shepherd, the metropolitan printed several books of service in Iaşi to support the Orthodox faith, namely: Cazania (collection of sermons), The Seven Sacraments, Response against Calvin’s Catechism, Pravila (code of church laws), Paraklesis Hymn to the Mother of God, etc. His work entitled Cazania or Romanian Book of Teaching on the Sundays during the year, on royal feasts and on great saints’ feasts (1643) was the first Romanian book printed in Moldavia. It was spread to all the Romanian provinces, especially to Transylvania, uniting in spirit and faith the Romanians who were living on both sides of the Carpathian Mountains. During the pastoral service of metropolitan Varlaam, the beautiful church of the Three Saints Hierarchs was built in Iaşi, the most important place of worship founded by ruler prince Vasile Lupu. It was in this church, consecrated in 1639, that metropolitan Varlaam has often preached the Gospel of Christ with diligence and wisdom. It was also there that on 13 June 1641 the pious metropolitan laid the relics of Pious Paraskeva offered to ruler prince Vasile Lupu by the Ecumenical Patriarchate of Constantinople, as a sign of gratitude for the help he had given it at the time of the ecumenical patriarch Parthenios I (1639–1644). In order to strengthen the Orthodox faith and to illuminate the young ones, metropolitan Varlaam urged ruler prince Vasile Lupu to set up in Iaşi, in 1640, the first school of high education in Moldavia, according to the model of the Spiritual Academy of Kiev, set up there by Saint Hierarch Petru Movilă. The new place of culture in Moldavia, where education was taught in Greek, Slavonic and Romanian, was seated within the precincts of Three Saints Hierarchs Monastery of Iaşi, operating first also with professors sent by metropolitan Petru Movilă. After ruler prince Vasile Lupu lost the princely throne, in 1653, metropolitan Varlaam retired to Secu Monastery where he became monk, wishing to live a life of peacefulness and quietness, according to chronicler Miron Costin. The wise metropolitan lived for four more years there, in humbleness, prayer and holy life, passing away towards the end of the year 1657. He bequeathed to the monastery everything he had acquired in his lifetime. He was buried in the southern wall of Secu Monastery. Given his endeavours to defend the true faith, for his holy life and the spiritual light he offered to the Romanian righteous people, following the proposal of the Metropolitan Synod of the Metropolitanate of Moldavia and Bucovina, on 12 February 2007, the Holy Synod of the Romanian Orthodox Church placed the educated metropolitan Varlaam of Moldavia among saints, to be celebrated on 30 August. His relics are laid at present in a shrine, in the church of Secu Monastery. Because of the patriarch’s extreme age, Alexander substituted for him at the First Ecumenical Synod at Nicea (325). Upon his death, Saint Metrophanes left instructions in his will to elect his vicar to the throne of Constantinople. During these times His Holiness Patriarch Alexander had to contend with the Arians and with pagans. Once, in a dispute with a pagan philosopher the saint said to him, “In the Name of our Lord Jesus Christ I command you to be quiet!” and the pagan suddenly became mute. When he gestured with signs to acknowledge his errors and affirm the correctness of the Christian teaching, then his speech returned to him and he believed in Christ together with many other pagan philosophers. The faithful rejoiced at this, glorifying God Who had given such power to His saint. The heretic Arius was punished through the prayer of Saint Alexander. Arius had apparantly agreed to enter into communion with the Orthodox. When the Emperor asked him if he believed as the Fathers of Nicea taught, he placed his hand upon his breast (where he had cunningly concealed beneath his clothes a document with his own false creed written upon it) and said, “This is what I believe!” Saint Constantine (May 21), unaware of the deceitful wickedness of Arius, set a day for receiving him into the Church. All night long Saint Alexander prayed, imploring the Lord not to permit this heretic to be received into communion with the Church. Saint John IV the Faster, Patriarch of Constantinople (582-595), is famed in the Orthodox Church as the compiler of a penitential Nomokanon (i.e. rule for penances), which has come down to us in several distinct versions, but their foundation is one and the same. These are instructions for priests on how to hear the confession of secret sins, whether these sins have been committed, or are merely sins of intention. Ancient Church rules address the manner and duration of public penances which were established for obvious and manifest sinners. But it was necessary to adapt these rules for the secret confession of things which were not evident. Saint John the Faster issued his penitential Nomokanon (or “Canonaria”), so that the confession of secret sins, unknown to the world, bore witness to the good disposition of the sinner and of his conscience in being reconciled to God, and so the saint reduced the penances of the ancient Fathers by half or more. On the other hand, he set more exactly the character of the penances: severe fasting, daily performance of a set number of prostrations to the ground, the distribution of alms, etc. The length of penance is determined by the priest. The main purpose of the Nomocanon compiled by the holy Patriarch consists in assigning penances, not simply according to the seriousness of the sins, but according to the degree of repentance and the spiritual state of the person who confesses. Among the Greeks, and later in the Russian Church, the rules of Saint John the Faster are honored on a level “with other saintly rules,” and the Nomocanons of his book are accounted “applicable for all the Orthodox Church.” Saint Nicodemus of the Holy Mountain (July 14) included him in the Manual for Confession(Exomologitarion), first published in 1794, and in the Rudder (Pedalion), published in 1800. The first Slavonic translation was done quite possibly by Saint Methodius, Equal of the Apostles, at the same time as he produced the Nomocanon in 50 Titles of the holy Patriarch John Scholastikos, whose successor on the throne of Constantinople was Saint John the Faster. This ancient translation was preserved in Rus in the “Ustiug Rudder” of the thirteenth century, which was published in 1902. From the sixteenth century in the Russian Church the Nomocanon of Saint John the Faster was circulated in another redaction, compiled by the monks and clergy of Mount Athos. In this form it was repeatedly published at the Kiev Caves Lavra (in 1620, 1624, and 1629). In Moscow, the Penitential Nomokanon was published in the form of a supplement to the Trebnik (Book of Needs): under Patriarch Joasaph in 1639, under Patriarch Joseph in 1651, and under Patriarch Nikon in 1658. The last edition since that time is that printed in the Great Book of Needs. A scholarly edition of the Nomocanon with parallel Greek and Slavonic texts and with detailed historical and canonical commentary was published by A. S. Pavlov (Moscow, 1897). Saint John is also commemorated on September 2. Saint Paul, by birth a Cypriot, became Patriarch of Constantinople (780-784) during the reign of the Iconoclast Emperor Leo IV the Khazar (775-780), and was a virtuous and pious, but timid man. Seeing the martyrdom which the Orthodox endured for the holy icons, the saint concealed his Orthodoxy and associated with the iconoclasts. After the death of the emperor Leo, he wanted to restore icon veneration but was not able to accomplish this, since the iconoclasts were still quite powerful. The saint realized that it was not in his power to guide the flock, and so he left the patriarchal throne and went secretly to the monastery of Saint Florus, where he took the schema. He repented of his silence and association with the iconoclasts and spoke of the necessity for convening the Seventh Ecumenical Council to condemn the Iconoclast heresy. 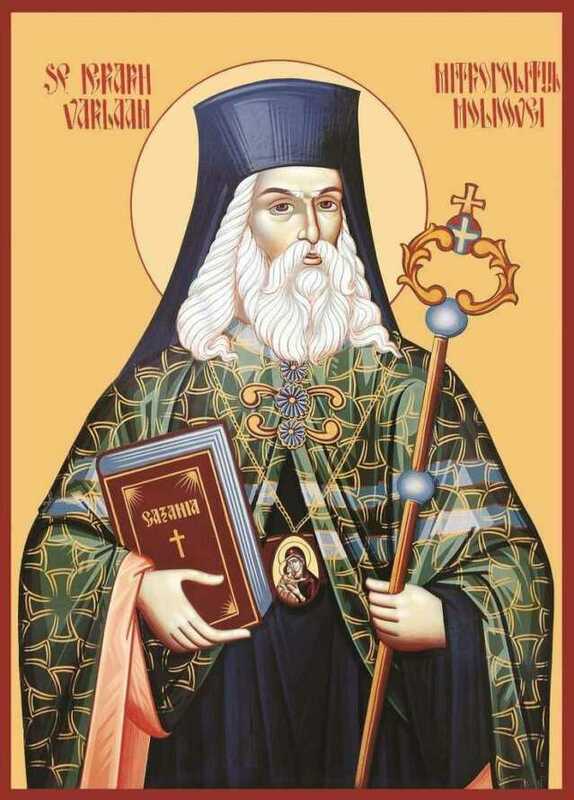 Upon his advice, Saint Tarasius (February 25) was chosen to the patriarchal throne. At that time, he was a prominent imperial counselor. The saint died as a schemamonk in the year 804.